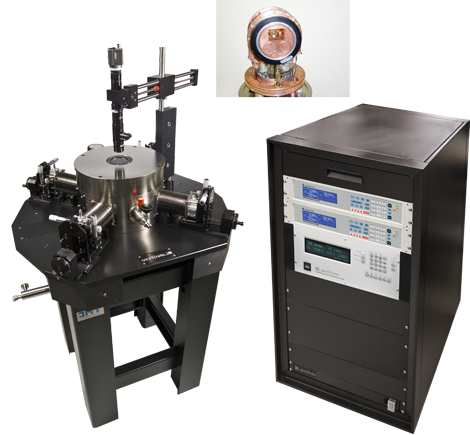 The Lake Shore Model CPX-HF probe station enhances the standard probe station capabilities with the addition of a ±1 T horizontal field superconducting magnet. It can do all the CV, IV, microwave, and electro-optical probing that a Model CPX can do, plus in-plane horizontal field superconducting magnetic measurements. To maximize the field of the horizontal magnet, however, the sample size is 25 mm (1 in). Researchers can use it for testing magneto-transport parameters. The sample can be maintained at elevated temperature during cool-down, reducing the potential for condensation, a critical requirement for measuring organic materials. The CPX-HF is one of Lake Shore’s premium probe stations for combining microwave measurements with magnetic field.